We'll have to wait a little while longer for our second glimpse at Grand Theft Auto V.
With the announcement earlier this week of an official launch window for the next Grand Theft Auto title, anticipation for Rockstar's upcoming release is gaining momentum. Unfortunately, Hurricane Sandy seems to have put a damper on the second planned trailer for GTA V, as the developer's New York office is without power. "We are working on a second trailer - unfortunately Hurricane Sandy has derailed our plans somewhat but we will have something to show soon," Rockstar notes on its official site. "It's hard to be precise as we have no power whatsoever in our New York office. We hope everyone else in affected areas is doing okay." The first trailer for Grand Theft Auto V debuted way back in November of 2011, and showed off - among other things - the Southern California setting. 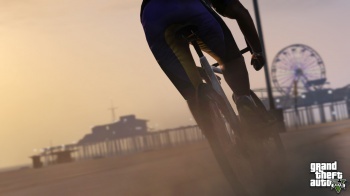 Pre-orders for Grand Theft Auto V are scheduled to begin on November 5th. The game is slated to arrive in Spring of next year, though no firm date has yet been established.